Jake, Jenn and Chris work very hard to spread a positive message about Super Powers. Here's a look at how they are having an impact! Jake and Jenn have presented to many police agencies and trainings. Here's a glimpse of Jake in action! The public speaking event that started it all was Autism Night Out 2015 for the Montgomery County MD Police. You can see the speech and others on my Youtube Page! Press Release for the Event. The Germantown Pulse online news source profiled Jake in July 2015. Jake gives a little insight into his Super Powers in this interview from March 2014. Jenn is guided by the first autism super mom, Eustacia Cutler and advises on the development of the Temple Grandin Eustacia Cutler Autism Fund! 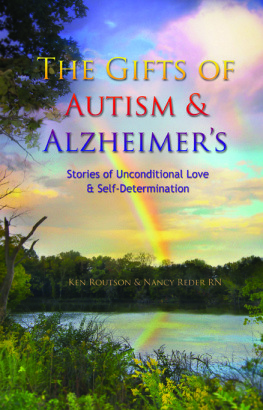 Jenn is published in an uplifting and encouraging book about Autism and Alzheimer's Disease and the unconditional love needed to deal with both! The book went on sale Feb. 2014 through Amazon. Excited to be a featured article on Blogher.com ! The wildly popular blogging site for women! Jenn is a member of the parent advisory board for the Maryland Association of Nonpublic Special Education Facilities (MANSEF) which represents more than 90 nonpublic schools throughout Maryland serving students with a range of disabilities. Jenn is very excited about new endeavors with the Archdiocese of Washington! Find out more about the Ministry for Persons with Disabilities here. Jake's need for balance and order in the world produce some pretty awesome pictures! The Proper placement in school makes all the difference in the world... quite literally. Read our story here, as published in Potential Magazine! So honored and humbled to see Jake profiled in the Kennedy Krieger Institute's Calendar for 2014. With the help of KKI and KKS MCC he is overcoming the odds! Read the story here! Jake's story was told in the ADDitude Magazine in June of 2013. His Art Therapist Stacy interviewed him and shared the benefits of their sessions! Jenn and Jake were a small part of World Autism "Action" Day 2013! Thanks to Fox5's Bob Barnard for his great story to educate! Thrilled to be part of the great Unwinding Autism community in 2013/14. This new initiative designed to help families to thrive with Autism, is earning kudos from leaders in the Autism field. Unwinding Autism Part II is coming soon in 2014! Visit Jenn's real job... in addition to managing Jake's budding career, she's the Executive Director of Upcounty Community Resources! Additionally, has been invited to take part in graduate-level college classes, present at professional conferences and schools. She has presented to families/parents at churches in and around the Washington D.C. Metropolitan area. So happy to be a contributor for the Organization for Autism Research. In addition to advising on community support topics, I'm honored to write for such a great organization! Sign up for the newsletter and blog! Great information every month.